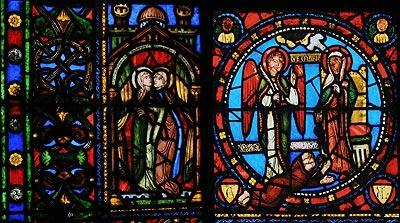 The Basilica of St. Denis (Basilique St. Denis) is located in St. Denis, a suburb in the northern part of Paris. It is listed as a French National Monument. This church is most famously the burial site of most of France’s monarchs during the period from the early 1000’s until 1789. As a landmark of architecture, the church has had a long history of design and redesign, and is known as one of the first examples of the Rayonnant style, as well as one of the first structures to use nascent Gothic elements in its design. The Abbot Suger of Saint Denis had the idea to create a church that would overshadow all others at the time, and within four years his dream started to be realised with the construction of the lobby of the church. This original design was in the early Gothic style, with high vaulted ceilings whose grandiosity was intended to give the impressing of stretching out to heaven. After another four years the choir was completed – an impressively short construction time compared with many churches at that time. Not much of the original structure in the early Gothic style remains today. A century after its construction the building was redesigned in the Rayonnant style, which, though still part of the Gothic style, placed emphasis on decoration rather than sheer size. Begun in 1231, this redesign made it considered by many to be the first Rayonnant style church, with elaborate stained glass windows, a radiant rose window in the façade, and statue columns. The abbey of the church is where the Kings of France and their respective families are buried, and only three kings were not interred here after their deaths. 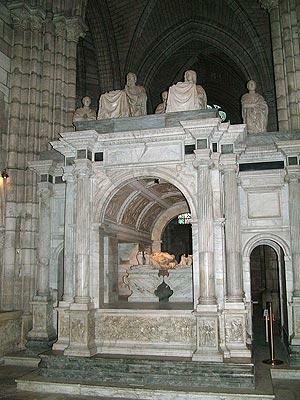 Most famously, King Louis XVI, his wife Marie Antoinette and his sister were not allowed to be buried at Saint Denis. 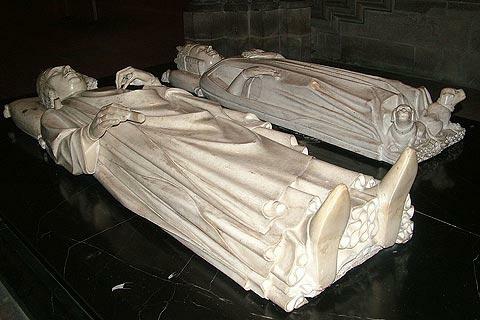 After their beheadings, they were buried in the churchyard of La Madeleine. 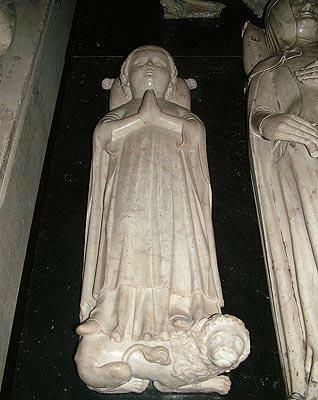 The Dauphin, who died of an illness before he could grow up to be Louis XVII, was also buried elsewhere, in an unmarked grave. In 1789, during the French revolution, the tombs at St. Denis were opened and all the remains were dumped into mass graves. They were left in these graves, unmarked, though the reign of Napoleon Bonaparte. 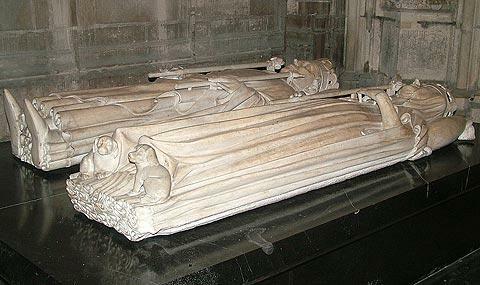 After Napoleon’s exile, there was some effort to recover the bodies, but the decay left the bodies indistinguishable and thus it was decided to take all the recovered remains and place them in an ossuary in the Basilica of Saint Denis, behind a marble plate engraved with the names of the buried. The basilica is several kilometres north of central Paris so is not among the most visited of the monuments in the city. However, there is a metro station called Basilique de Saint-Denis close to the basilica so it is easy to reach from the city centre. Admission costs around 8 euros. Before entering the basilica take time to enjoy the facade, which has a small rose window and decorative stonework above three carved portals. 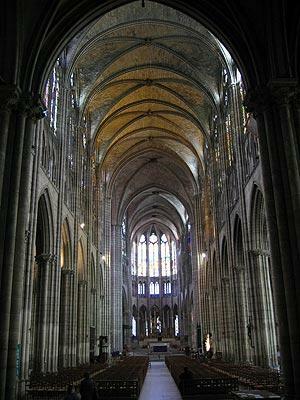 Remember that this gothic style, very common if you have looked at other cathedrals in France, was revolutionary when it was first used here at Saint-Denis. 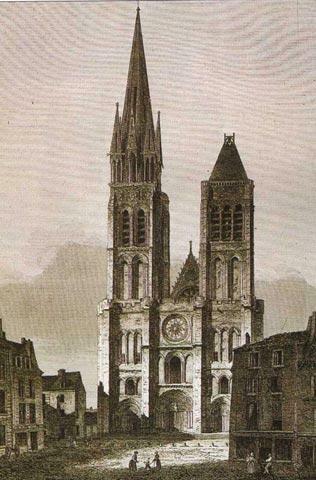 The basilica also originally had a larger tower on the left but this was destroyed by a fire in the early 19th century. Note: if you have visited the Basilica of Saint-Denis several years ago it is worth another visit because the facade has been very carefully cleaned and restored in recent years and the portals are now very impressive. Inside it is the vaulting above the choir that is the most architecturally interesting feature, as well as the rose window and the stained glass windows (although most of the stained glass is from the 19th century restoration). 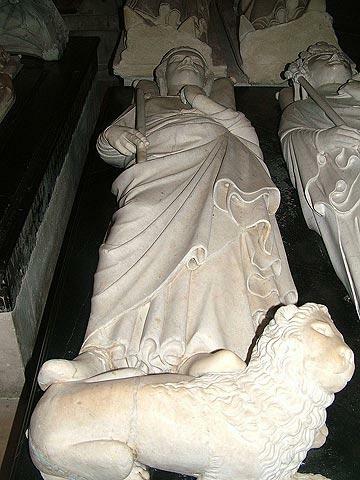 The tombs are also of great interest because of the many important Kings buried here including Francois I, Charles V and Louis XII. Although most of them were damaged during the Revolution and the bones have become mixed together over the centuries most have been restored. 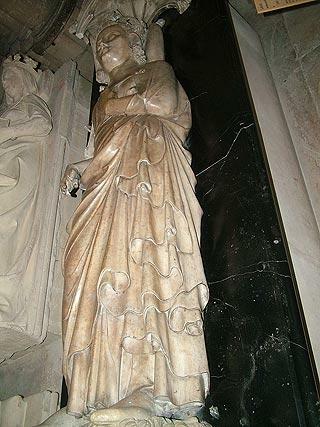 In total there are about 70 tombs and monuments here, with the tomb of Louis XII and Anne de Bretagne and the statues of Louis XVI and Marie Antoinette among the most imposing. You can find more local travel ideas in the Paris guide and the Paris region guide.